Embarking on a website redesign is no small undertaking. It will require a substantial amount of strategy, organization, and company soul-searching. Not only will you need to ask difficult questions, but you’ll need to provide answers that satisfy every major stakeholder. This prospect alone is enough to deter some organizations from pressing forward, but there are steps you can take in order to not only streamline your redesign project, but ensure that everyone’s needs are met. Before we get into the specifics, let’s ask my favorite question: “why”? What is the problem with your current website, and what is your goal for the new website? Now that you’ve determined why your website needs to be redesigned, and what your goals are, you can begin the process of organizing your assets through a Content Inventory Audit. This is a simple spreadsheet of all your existing webpages and their corresponding URLs. A Content Inventory Audit is a task often done toward the beginning of a website redesign project, and essential for any [website or intranet] content migration project. It is a great way to think through a redesign but may not be the best way to plan a completely new website. The spreadsheet stores information about each page on the website; a very handy tool that provides a quick overview of your site. What's the purpose of the page? Who is the target audience of that page? More criteria are covered in the related webinar. As you prepare to add content to the website, think about who will contribute. In a five-person business, it might be just two of you, and that’s fine. In a large business or organization, 5, 10 or 15 people might be contributing content. The time required to edit and proofread both copy and visual content grows exponentially in relation to the number of people who contribute content. Once you’ve mapped out your existing webpages, you can begin to look at the specific content contained within them. The type of content you’re creating will obviously vary depending on your organization’s goals and your audience’s needs, but here is a list of the most common content- this is not even close to an exhaustive list. Now it’s time to think about future expansion. For example, you might start out with six news items in your news section, each with brief summaries and links to the full view of the item. But what happens when you have 10, 20 or 50 news items? Do you want to archive old news? Paginate the items? Show only the last 10 items? Consider these questions in the design process. For websites that accumulate content, such as news, press releases and reports, there’s a good rule to follow when creating mock-ups (you can never have enough mock-ups!) In other words, if you think the layout or design of a page or section of the website will differ significantly from other pages, then mocking it up is worthwhile. This step normally comes after the initial mock-ups are approved. A sitemap lists the structure and content of the whole site, roughly similar to the "table of contents" in a book. A sitemap can be an effective planning tool for both designers and non-designers. It’s a centralized document that can help organize and clarify the content on your site, as well as help you identify future pages and eliminate unnecessary pages. visitors first and search engines second. Once you’ve determined the structure of the content, you can move to the first step in the design process. Wireframes! A wireframe contains the core components of an individual page, communicating hierarchy, user interface patterns, logic, content types, and potential structure. It’s a representation of how the website interface might work. It is NOT the final visual design or layout. It’s important to avoid the desire to make everything look perfect in a wireframe. This phase of the process is meant to help you guide the design, not actually be the design. unique page on your site (Homepage, product page, contact page, etc.) It isn’t necessary to create a wireframe for every product page, unless you intend for them to have significantly different layouts and functionalities. Once the wireframes have gone through your review process with the powers that be, NOW you are allowed to move to the design stage. Last, but not least, in planning out the structure of your website, a Web Style Guide needs to be developed, especially if there are multiple content contributors to your site. A style guide is where proper planning shines, as it will define all of the design, layout, interactive and type elements used throughout the website. A style guide can also help you start to pay attention to web accessibility standards. 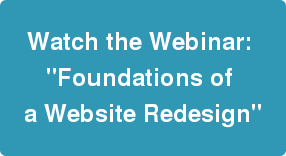 Watch the webinar "Foundations of a Website Redesign".